The model DRI-DC is an AC powered, DIN rail mount, DC input signal conditioner, with 1800 Vdc isolation between input, output and power. It provides a fully isolated DC output signal in proportion to a DC input. The field configurable input and output feature offers flexible, wide ranging capability for DC current and voltage signals. Using a pushbutton instead of potentiometers, improvements in calibration resolution and reliability are realized due to the elimination of the potentiometers’ mechanical variability. The thermal drift and mechanical variability of the potentiometers has been removed and replaced with a digitally stable circuit. Additionally, the inherent zero and span interactivity of analog amplifier circuitry is removed, providing 100% non-interactive adjustment. 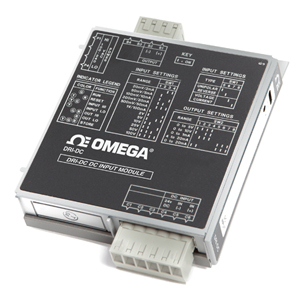 The DRI-DC can be field configured for virtually any DC input to DC output within the limits specified. Calibration utilizes touch calibration technology where the user simply configures the input for the current or voltage range via switches, then follows the calibration procedure. The output is set by adjusting the input until the desired output is present and then pressing the CAL button to store the output level. The DRI-DC has three diagnostic LEDs. The green (RUN) LED is used for diagnostics to indicate that power is on. It will flash quickly if the input signal is above the calibrated range or slowly if the input signal is below range. It is on continuously when the unit is functioning within the calibrated range. 注: An ACPB power rail is required to power the modules and is ordered separately.